Having been in the wedding suit business for many years, we have been proud to be part of all sorts of wedding themes from black tie weddings to beach weddings to vintage themed weddings. A wedding theme that is gaining popularity is English Heritage themed weddings. Where the grooms want to go for the “lord of the manor” look. 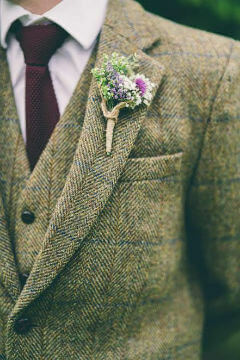 There is no better fabric than Tweed to achieve the English heritage or country wedding look. 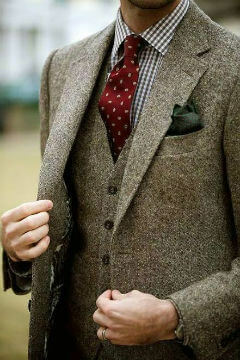 Tweed is a rough and unfinished woollen fabric that comes in more earthy tones such as browns, beige and olives. 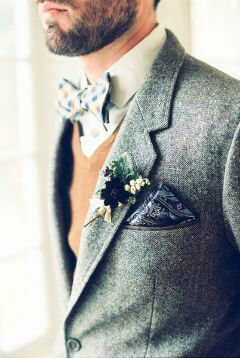 In the early 19th century tweed was considered as informal fabric but perceptions have changed. We have been part of ever growing popularity of tweed suits not just for wedding but for business suits too! So grooms who are looking for authentically British and chic wedding suit, tweed 3c suit would be the most natural choice. If one can carry it well then a 3pc suit featuring a double breasted vest would just seal the deal for country wedding look but if you are concerned about it being all too much tweed, you can have the vest done in tweed and jacket and trousers done in plain colours. With custom made suits your options are unlimited, you can mix and match to create the look you want. We know how important it is to look your best on your wedding day, we will guide you thru the whole process to give you the look you want that not only suits you but your wallet too! With at least 10 weddings a month we know how important it is to have the wedding party all well coordinated, we will take care of the groomsmen suits too. We have a huge variety of tweed fabrics in light to medium weight fabrics in different colours and textures. There is no better fabric than tweed for a rustic wedding in a country church or barn, nothing better than man dressed in a tweed wedding suit against the misty backdrop of green fields and hills. Planning a country side English heritage themed wedding, come and see us at our Western Sydney office or CBD studio to explore your wedding suit options.